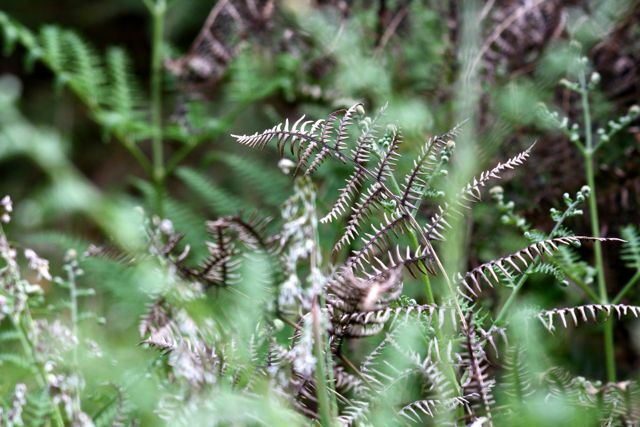 Bracken fern is another one of my longtime favorite plants – and not just because the young, furled tips are tasty in salads or while on the trail. This unpretentious plant is both attractive and hardy. You see it in woodsy understories, on dry hot hillsides, and everywhere in between. In the autumn, it’s dry leaves add a particular, pleasant scent to the fragrance of the forest. Wildlife uses it for food and nesting material; sometimes I’ve found beaten-down areas in larger patches, where deer have bedded down to sleep. Distinct from other ferns, its large (up to 2 feet) fronds are broadly triangular, and often have an airy quality to them, with a lot of space between each sub-frond. Underneath, the fertile spores are found in a line hugging the edge of every leaflet. Even when these sori aren’t brown and ripe, you can see them as a raised green rim – another good diagnostic clue. None of the many other ferns in the area has this combination of obtuse outline, frond type, large size, and brown spore rim. Pteridium aquilinum can be found growing throughout most of North America. In fact (according to the USDA plants database) the only state in the US that it isn’t found in is South Dakota, which is odd enough that one has to wonder if it’s a data glitch. Or… maybe there is a legit ecological reason that this is the only state our fern has shunned! These “woodland stars” twinkle along forested trailsides in the springtime. They are like a high-end graphic designer’s version of a flower, with their many delicately pointed pale pink petals and curving yellow-tipped stamen. The blossom is usually displayed singly, rising from the center of a ring of spring-green leaves. Trientalis latifolia is the only one of its kind found in Marin, and usually grows under redwoods or other evergreens. 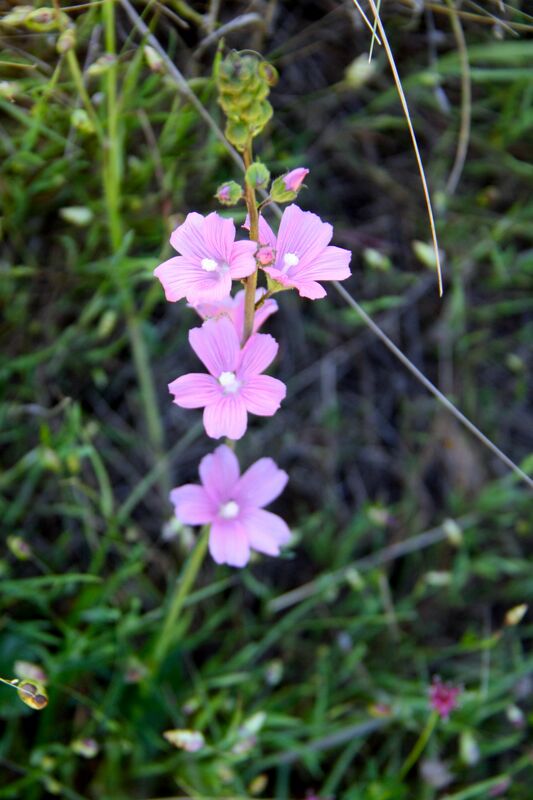 Though it often can be found in wetlands and moist hillsides it can also thrive in drier spots. Here is another tiny plant of the meadows. When I first saw the arrangement of pointy purple globules, I thought they were the seeds of some spent flower. But when I looked closer I saw the white lips of petals peeking from beneath each point. It turns out the globules aren’t solid, like seeds, at all. Instead this is Trifolium depauperatum, a type of clover where the flower forms an inflated sack – hence its many names (balloon clover, dwarf sack clover, cowbag clover). Click on the photos below to get a better view of this nifty little flower. There are two features which reveal that this plant is likely to be a clover: first, the three-leafleted leaves, which all clovers have (though some are longer and some are rounder). Second, the fact that the flowers are all clustered together into a single head at the end of the stalk. Little salmon-colored flashes can be seen peeking through low-lying grasses, usually beginning in March and going through September. 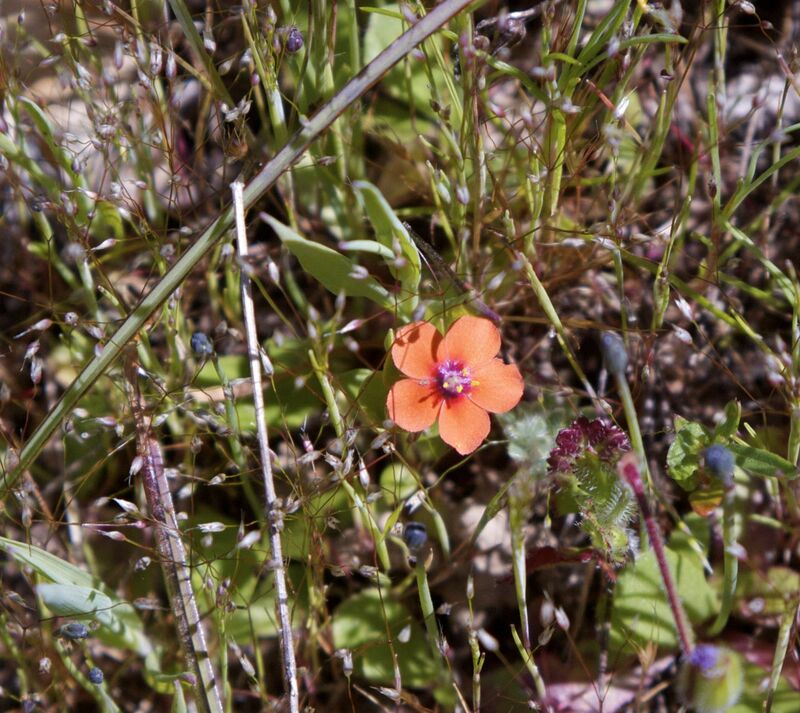 This is scarlet pimpernel, or Anagallis arvensis. Often it can be seen growing in grassy fields, road-cuts or trailsides along with a visual cacophony of other tiny flowers. It’s striking among them because it’s five petals are such a distinctive color, darkening into a rosy central ring around pinkish stamen. Because it’s everywhere, it’s an easy childhood favorite – at least, it was one of mine. So it was a sad grown-up realization to learn this little bloom is not native… But at least we have the comfort that it isn’t listed as “invasive”, meaning that although it didn’t originate from hereabouts, at least it isn’t doing much in the way of damage to the local species now that it has arrived. Sisyrinchium bellum, and isn’t it just? Bellum, that is. Or bellisima. On just about every springtime walk you take in Marin you’ll see these striking dark blue/purple flowers so they are a good one to know. Blue eyed grass are almost always blue, though once, last year, I found a pale morph (photo included below). Though they have five regular petals, they are in the iridaceae family along with iris. I see the similarity most in the way the uppermost leaves form a crisscrossing sheath (or “spathe valve“?) around the bottom of the flower. An unexpected spray of pink caught my eye along the trail. Here is a checker bloom (or checker mallow) – scientific name Sidalcea malviflora. This showy flower can be found throughout most of California, and is pretty in a sculptural way that makes it look more like a cultivated variety than a wildflower. It can grow up to a foot tall, and sometimes grows en masse in open fields — or scattered singly or in small groups, as I saw it. The flowers are about an inch across, and each vibrantly pink petal is nearly translucent and streaked with numerous pale lines. The white stamens form a fused, fringed tube at the center. Each bloom unfurls above its older neighbor on a long raceme. At any time several are usually in bloom while a cluster of green buds hangs above them, waiting for their turn in the sun. Checker bloom has several other cousins in Marin, all of which look pretty similar, but this is the most common and widespread throughout the state. They are in the Malvaceae family – the fused, fringed male filaments are one of the key ways (“diagnostics”, in botany-speak) to recognize this family. How about an easy one for a Monday! Common and important, unless you want to itch. Poison oak is easy/hard to identify, depending on how experienced you are in looking at plants. The leaves can range in color from dark green to light green to reddish, but they always have a glossy shine and another quality as well, one that’s distinct but hard to define. The leaves look… slightly luminous. Tender. As if, were you crazy enough to nibble on one, it would have a pleasant delicate texture. The flowers of poison oak are small, inconspicuous, and not usually in bloom, so the leaves are what to look out for. These always come in groups of three, and they have a smooth surface, the veins only showing lightly and the surface not haired or spined. The edges are gently lobed or scalloped – to varying degrees, but they are neither straight nor serrated (like the edge of a bread knife). This helps you rule out other common plants, like blackberry, that some people confuse for poison oak. Once you get all those features down, really the only thing that looks similar are the leaves of a young true oak tree before it has grown tall. The Latin name is easy to remember as well (even though I had forgotten it). Toxicodendron diversilobum. Intuitive, right? Toxic leaf with diverse lobes. Thanks John Torrey, Asa Gray, and Edward Greene who did the naming. Torrey produced the Flora of North America in the 1800s, and Gray helped him out. And how do I know they named our toxic friend, a newbie may ask? It says so right on all the official listings of the species. Check the names after the italicized species name on the above link: you’ll see Torr. and A. Gray, who did the original naming, along with Greene, who came along later and made some change – I’m not sure but maybe he is responsible for the “Toxicodendron”, since I seem to remember poison oak was a “Rhus” when I first learned it. Anyway this convention is called an author citation, with the namers being the “taxon authors“. So I was telling a friend about this blog, and I mentioned that I had keyed out one of the plants that I didn’t know – and she asked me what it means to “key”. So if you’re a veteran botanist, forgive me. But if you are a newbie, here it is: a plant key is a book of all the plants in an area, and it consists of a very long set of either-or questions. If you patiently (and correctly) follow the trail of questions along, eventually it will lead you to the only plant that has all of the characteristics that your plant has. A key is full of all sorts of obscure terminology like awn, bract, fusiform, and stolon. You also will stumble across common words that, in the context of the key, have specific meanings – like scale, or ray – which don’t mean at all what they do in the rest of the world. Back when I was in college, my botany-student friends and I would get together at parties, and as the beers went by we would have increasingly passionate conversations about some class or another. My roomate always loved hanging out with us, because he could make jokes later about how we were speaking an incomprehensible language. But that’s botany – you have to learn the language, and then it’s loads of fun. 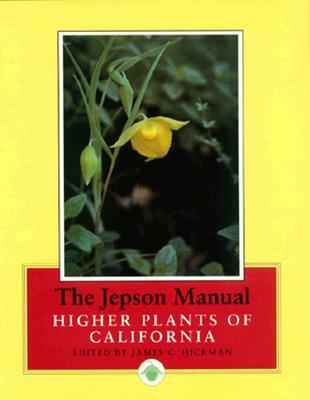 Here in Marin, the two keys that are most important are the Jepson Manual – which is the definitive key for the state – and the Marin Flora, which narrows down the number of choices by a lot, since you are only having to consider plants that are actually found in this county. Also handy is the Peterson Field Guide to Pacific States Wildflowers, which is a guidebook, not a key, but has a lot of the more common plants which you can look them up according to color and flower type. To key a flower, you’ll need a good hand lens (high powered magnifying glass) and maybe a pair of tweezers. This unassuming little plant is common in moist areas and in forest understories. Claytonia perfoliata also doubles as a tasty trailside snack, with a pleasantly plump and crisp leaf. The taste is mild and green, somewhere between spinach and lettuce. Native Americans and early western settlers ate it regularly, but now it is more of a novelty nibble.